We’re jammin’, jammin’, And I hope you like jammin’, too. Well those are not my words but are from the lyrics of famous Bob Marley Song Jamming. 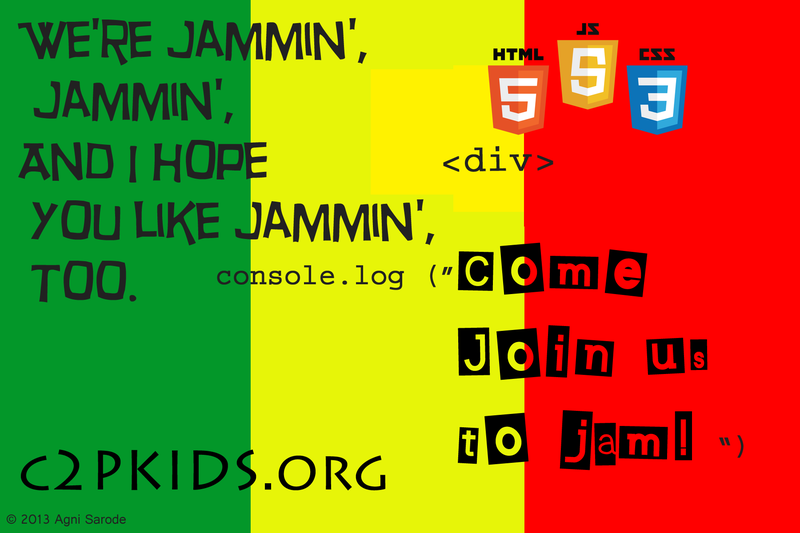 So what has Jamming got to do with C2PKids movement?—actually a lot. Many parents have been quizzing me on what exactly we teach in C2PKids, how we teach, what’s our teaching methodology blah blah ! But before I explain the teaching methodology @C2PKids –let me attempt to explain the teaching philosophy @C2PKids by introducing a common concept in music called Jam. A jam session is a musical event, process, or activity where musicians play (i.e. “jam”) by improvising without extensive preparation or predefined arrangements. Jam sessions are often used by musicians to develop new material (music), find suitable arrangements, or simply as a social gathering and communal practice session. Jam sessions may be based upon existing songs or forms, may be loosely based on an agreed chord progression or chart suggested by one participant, or may be wholly improvisational. Jam sessions can range from very loose gatherings of amateurs to evenings where a jam session coordinator acts as a “gatekeeper” to ensure that only appropriate-level performers take the stage, to sophisticated improvised recording sessions by professionals which are intended to be edited and released to the public. C2PKids teaching methodology is heavily influenced from the idea of musical Jams (as explained above). The core concept is we conduct weekly Programming Jams. These Jams are preceded by pre-Jam study material/course ware practiced by students during the week or over week-end before the Jam. The basic assumption is that for Jams to be successful , students will need to be brought to an appropriate level of knowledge before he/she can join a C2P Jam. Like in music, we have Jam session coordinators—they are C2P volunteer coaches (and optionally assisting coach). Jam is designed by industry experienced coach to horn a particular topic, expose students to a way of working or designing technology and is usually designed by extracting something from real world that looks like microcosm of real word technology problem. We are lucky to be in times when collaboration technology is at such sophisticated state that I see most Jams taking place online—crushing distances, time-zones & access barriers between a hungry student and a passionate coach. C2PKids Jams are organized as Google Hangout Events. Having emphasized on on-line Jams, I take it very seriously that an “in-person” Jam opens doors to a very interesting local economic impacts. With ‘in-person” Jams, I expect to see new friendships formed on basis of common love for technology and opportunity to form future startup teams. Charlotte, NC is probably best known as a Banking town not a high-tech start-up town. I live in Charlotte and love it. I feel that it has some great comparative advantages (relative to big daddy startup hubs like San Francisco, NYC, Boston, Seattle) to be the next high-tech start-up town. But more on that topic some day later—but bottom line is that if we are able to create a pool of technology producing generation of kids then Charlotte could find it’s place on start-up map (and venture funding follows, other economic windfall effects). At C2PKids we refer to a range of online course-wares (Codecadmy.com, W3Cschool.com, Computing Platform of KhanAcademy.org & many more). At this point I don’t see any point in favoring one course-ware platform over other—all of them have unique advantage and they specialize in different things. Like real world technology project execution, we refer to all as and when the topic demands it. 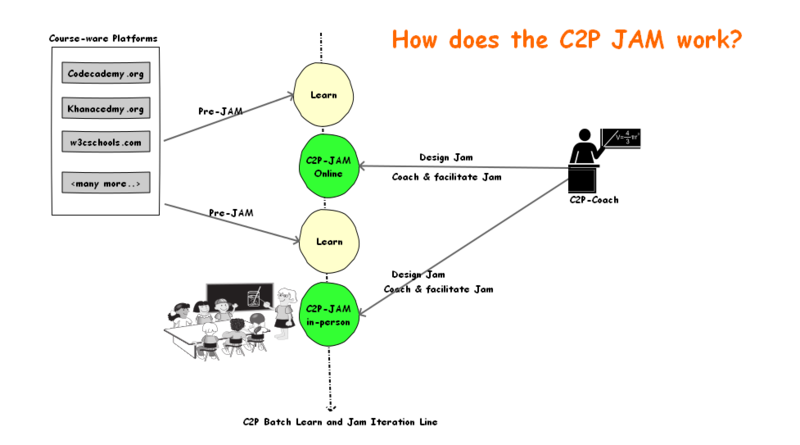 If you have realized by now then C2PKids teaching methodology is really a blend of Hackathon + Flip teaching methodology. Jams are nothing but extended duration Hackathons of lower intensity levels adjusted for 10-15yrs while Pre-Jam self-study sessions are Flips. The following schematic (click it for larger view) should bring all of these ideas together in concrete manner—if not feel free to drop me a note.